I love dried pineapple but I don't like that it is often full of white sugar! So I decided to make some of my own Pineapple Chips. But being the Lazy Girl that I am I did not want to work too hard, so I simply used a can of already cut pineapple. They end up on the chewy side and are delicious! Price wise, they are not a tremendous savings over buying natural dried pineapple. But if you get your cans at a decent price ($1 or less) AND use the juice for something else (either drinking or smoothies), it is not too bad. 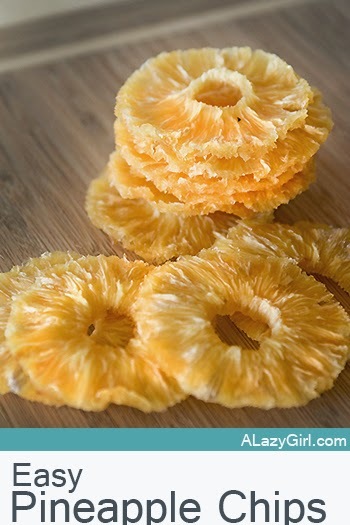 Each can will yield around 2 ounces of Pineapple Chips and 1 cup of juice. So if you want a pound of Pineapple Chips and 64 ounces of juice (which costs around $3) it will total around $7. I have found that you will pay approximately $7 for Pineapple Chips in the store but if you factor in the "free juice" it brings the cost down a lot. 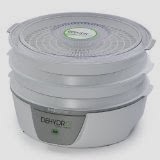 Dry at around 135 degrees for up to 12 hours or until dry and chewy. Note: if you do not have a dehydrator you can try drying these in a 200 degree oven on parchment covered cookie sheets. I am not sure of the time, but it should be less than 12 hours ;) .